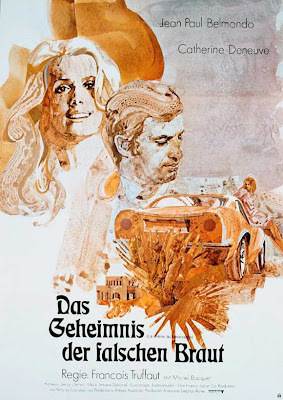 1968 had seen the release of one of François Truffaut's greatest films, the extraordinary Baiser Voles (Stolen Kisses), and every cinéaste was wondering what he would do next. Stepping away from the autobiographical Stolen Kisses, Truffaut decided his next film would be another literary adaptation taken from the same author who penned The Bride Wore Black, the flawed but striking film he had made just prior to Stolen Kisses. It was indeed during the shooting of The Bride Wore Black that Truffaut first came across Cornell Woolrich's 1947 novel Waltz Into Darkness (a thriller he had written under the name William Irish). Truffaut greatly admired Waltz Into Darkness, specifically the, "distribution of incidents, the appearances, disappearances, and reappearances of the main characters". Sensing it would make a great film, Truffaut kept the novel in mind during the tumultuous year of 1968, while he was immersed in revolution and Stolen Kisses, and by 1969 he was ready to embark on another Irish adaptation. Truffaut would re-title Waltz Into Darkness with the oddly compelling moniker La sirène du Mississipi (Mississippi Mermaid) and would admit that his final screenplay was, "less an adaptation in the traditional sense than a choice of scenes", taken from the book. 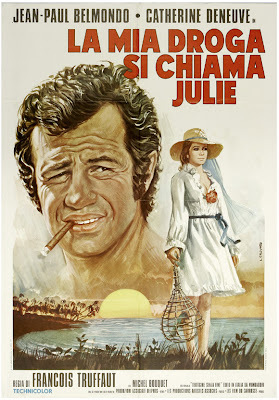 Even though he was able to, "realize every director's dream", of shooting Mississippi Mermaid in chronological order, the film would turn out to be one of his more fragmented and problematic works. When it works it delivers big-time, and is as resounding as any film from the period, but it feels overlong and it meanders in spots where it should really flow. 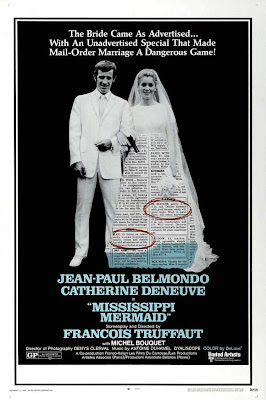 Mississippi Mermaid is a better film than The Bride Wore Black but it isn't one of Truffaut's more transcendent works, even though it did give him the opportunity to finally work with two of the most iconic stars France had ever known. Just before shooting commenced on Mississippi Mermaid, Truffaut called Jean-Paul Belmondo his, "favorite actor", along with Jean-Pierre Leaud. Calling him the most, "complete actor", in France Truffaut was giddy with the possibility of working with Belmondo although he would write to producer Robert Hakim as early as 1966, when he first approached Belmondo about the gestating project, that the great actor liked the novel but had great concerns about the, "character's age", and that he was too young for the part. The two finally agreed to work together and with the casting of Belmondo, Truffaut now had half of his dream-team in place. Truffaut had already worked with several of Europe's great screen beauties by 1969, but one that had so far alluded his camera was legendary Catherine Deneuve, an artist whose looks were only overshadowed by her acting ability. Truffaut admitted that it was, "impossible not to think of her", for Mississippi Mermaid. Ironically the studio had thought the same thing and had actually tried to convince Deneuve to make the film with a safer director which Truffaut recalled that, "she refused (pretty courageously)", to ensure that they could finally work together, nearly eight years after Truffaut had directed her iconic and much-missed sister Francoise Dorleac in The Soft Skin. Deneueve had reservations about Waltz Into Darkness but she was moved by all of the letters Truffaut wrote to her attempting to convince of her its value and she wrote, in her journals, that she was, "looking forward to doing Mississippi Mermaid", even though it wouldn't turn out to be the success anyone thought it might be. Perhaps Deneueve knew that working with Truffaut would bring up thoughts of her tragic sister, a leading light of sixties cinema who had been killed in the summer of '67 in a horrible car-crash. While celebrating her 25th birthday on the set of Mississippi Mermaid, the famously composed Deneuve wrote that she, "burst into tears", when she realized that was how old Francoise was when she left her. She would go onto write that Dorleac would, "haunt me at night" all throughout the filming of Mississippi Mermaid. 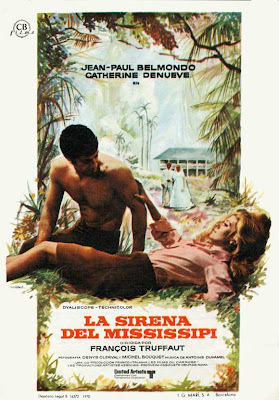 Truffaut his cinematographer, Denys Clerval, and the rest of the crew and cast would travel to a variety of locations while filming Mississippi Mermaid including Reunion Island, Nice, Antibes and Lyons. They would wrap the difficult shoot up near snow covered Grenoble, the location where Mississippi Mermaid would mount its chilling and eerie ending. It was the biggest production Truffaut had mounted since Fahrenheit 451 several years earlier, although the final product would not have the same impact as his wonderful Bradbury adaptation. Mississippi Mermaid tells the story of a lonely and rich owner of a tobacco plant named Louis who, frustrated be his lack of a love-life, orders a mail-order bride. When the mysterious woman named Julie arrives, Louis takes note that she looks nothing like the photograph that had been supplied to him but ignores this fact due to how beautiful and perfect Julie seems. The two's idyllic relationship soon begins to turn sour though when the real reason for Julie's arrival becomes more apparent to Louis. Truffaut's second adaptation of a Woolrich novel once again finds him paying cinematic tribute to an artist he was totally immersed in at the time, Alfred Hitchcock. Truffaut's historic recorded talks with Hitchcock from earlier in the sixties were still fresh in his mind and Mississippi Mermaid is a film that actually deserves the description of 'Hitchcockian", even though ultimately Truffaut would dedicate the film to another one of his great cinematic heroes, Jean Renoir. Truffaut would write that, "this one goes to Renoir because, in my work of improvisation, it was of him that I was always thinking." Perhaps the sense of cinematic unease that is apparent throughout Mississippi Mermaid has something to do with the idea of improvisation that Truffaut was looking to bring to the film. He wanted Belmondo and Deneueve to reflect the surprise of their characters so he would often hand them their dialogue at the last possible moment so that they, "had just time enough to learn their texts." For a film that relies so much on narrative drive, this choice might have ultimately been a mistake as the production doesn't feel as consistently compelling as it should be. Belmondo and Deneuve are both remarkable in the film but one can't help but wonder if a more controlled shoot might have made Mississippi Mermaid a more successful film. 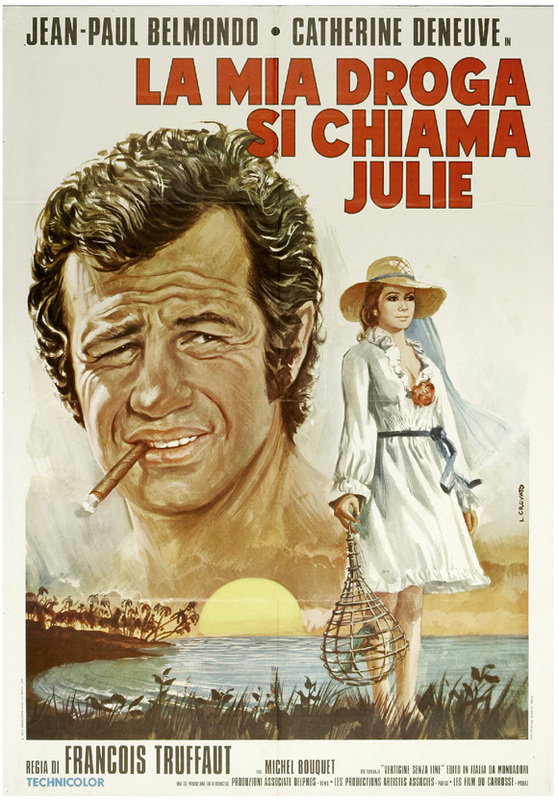 While Mississippi Mermaid feels overlong and confused at times, it is still ultimately a pretty fine film highlighted by some of the most memorable moments in Truffaut's canon, terrific performances by Belmondo and Deneueve and a final section that is quite devastating to watch. The film was not a hit with audiences though and it wouldn't be released in the states until 1970 in a version that was cut by more than fifteen minutes, an act that would make it feel even more disjointed. Critical opinion on Mississippi Mermaid has always been sharply divided. The great film-historian and Truffaut biographer Annette Insdorf would write that the film, "ultimately falls short of Truffaut's other efforts", and, "one of the film's problems is its lack of cohesion." Robert Ingram, on the other hand in his Taschen study of Truffaut, was much kinder and would call the film wonderfully, "nuanced." Truffaut himself considered the film a failure due to the fact that he hadn't made a work audiences could relate to, something he felt was his responsibility as a filmmaker. MGM's Region 1 non-anamporphic presentation (from which my stills were taken from) of Mississippi Mermaid leaves a lot to be desired but the disc still is in print for those who haven't seen the film here. The film is also available on a Region 2 disc where it has thankfully been given a much-needed anamporphic presentation, although sadly it is as bare-bones in the extras department as the American disc. Mississippi Mermaid is interesting although I think The Bride Wore Black was more successful.